The Westin Chosun Seoul, Tuesday, November 14, 2006- The Westin Chosun Seoul is proud to present a smarter and more sophisticated LCD TV with a superior Digital TV Information Service in all the rooms and suites. Now, enjoy access to our complete hotel directory and local attractions by simply pressing the remote control. 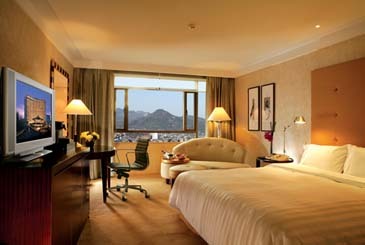 Your every need can be taken care of quickly and efficiently from the comforts of your own room. When a guest first enters the room, a welcoming message will appear on the TV screen. Following this message, the main menu screen will present a list of choices for you to select whenever you please. The Digital TV Information Service provides guests with extensive information and unlimited service options. You can leisurely browse through room service, concierge service, laundry request, message service, and flight booking, or search for any information about Seoul or recommended restaurants for your evening out. Also, the 'My Account' feature will show you the total amount that you have spent during your stay, allowing you to control and easily keep track of your budget. For guests using credit cards, in-room check-in/out is also available. You can also watch international news, documentaries, sports, movies, and more from 50 different channels, the greatest number available from hotels in Korea. Also, you can select from your choice of English, Japanese or eight other languages.